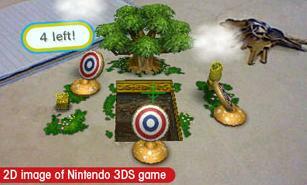 Nintendo's 3DS augmented reality games are one of the coolest aspects of the system, for as long as they last anyway. At the New York Nintendo 3DS event, there were a few big surprises for me. 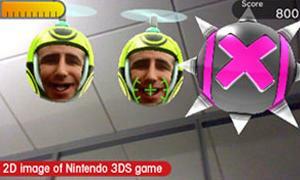 One was when I actually took hold of the 3DS's augmented reality (AR) capabilities. Not only are the AR games launching with the 3DS a ton of fun, but AR definitely has the potential to make just as deep a mark on 3DS players as no-glasses 3D. The most in-depth AR game Nintendo showed off was Face Raiders. I began the game by taking a picture of my own face. Little did I know that I'd become Face Raiders' primary foe, and would be shooting at myself for the next 15 minutes. Aptly named, Face Raiders tasks players to destroy their own face, their friends' faces, or maybe even the faces of their pets (I didn't get to try that out). Once a picture of a face is taken, it's placed on top of a floating orb-type enemy that you must aim at with the 3DS. However, Face Raiders doesn't use the stylus or the analog stick to aim. It uses the 3DS's internal gyroscope. You target enemies in Face Raiders by moving the 3DS up, down, and all around (literally in 360 degrees). This is not a game you can play on an airplane without severely annoying your neighbors. In public, however, Face Raiders really shines, because it picks up on faces in the environment and adds them into your game. You'll have to rescue and defeat complete strangers too. Speaking of your environment, it's the background for Face Raiders. 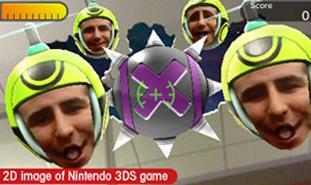 Using the 3DS's outer cameras, Face Raiders's floating foes appear to break through the real world. If you don't kill them in time, they'll start to destroy it, ripping holes in the fabric of reality. It's very clever. Face Raiders has way more depth than I expected when first hearing about it. The game only has six stages, but each is completely different and ends with a boss fight. Stage 1 was pretty simple, featuring enemies that simply floated around while attempting meager attacks. Stage 2 adds enemies that dart across the screen when shot, so to kill them you've got to match their movements. Stage 3 featured square enemies that would flip my environment around like tiles. Meanwhile, the general behavior of enemies keeps becoming more challenging, with foes that once were pretty docile now eating through the background like Pac-Man. Bosses are also varied, including one that hid in the holes of my environment and another that was guarded by a ring of lesser enemies. Altogether, Face Raiders is really fun and unlike anything I've ever played before. With only six stages, it still has the feeling of a mini-game, but it does come pre-loaded on the 3DS so it's basically a bonus. As a bonus, it's a very entertaining piece of software that should provide a couple of gameplay hours. So that's Face Raiders, but Nintendo also had another AR game to show off called AR Archery. This game uses the 3DS cameras to read an AR card which looks like one of Super Mario's "?" blocks. When at the proper distance (about 14 inches away), a little box will pop out of the block on your 3DS screen. Shoot it, and more boxes will pop out with targets on them. The goal is to hit every target while moving the 3DS around the AR card, but the card must stay at a certain distance and in view, so you aren't moving frantically like you do in Face Raiders. The "wow" factor during AR Archery came when a target actually appeared to be hidden inside of the table the "?" block card was placed on. I had to move the 3DS over the card, and shoot downward. 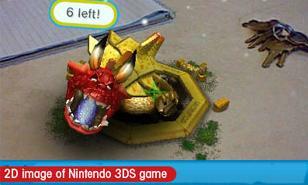 The boss of AR Archery is a dragon with multiple segments, with players having to move to shoot each while it attacks. It's definitely a nice tech demo, but was over in less than 5 minutes. Nintendo was only talking about AR Archery and Face Raiders for its AR lineup, but they're very good indications of what's to come. These smaller experiences make me intrigued about the potential of AR integration into larger budget 3DS games.